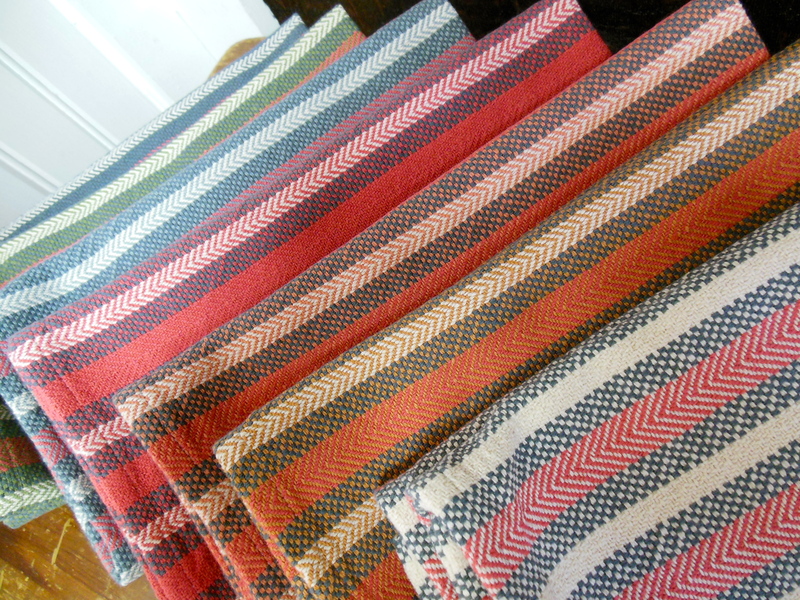 Finished weaving these today and they are off the loom being wet-finished. Unvailing tomorrow! Winding a warp while waiting for weft. [youtube=http://www.youtube.com/watch?v=Kp0scSttSSA&w=560&h=315] My son and I had a little fun using iMovie and of course there is more weaving. Little snippets of how a rag rug is woven. She's off the loom, hemmed and in service. 13.5' of indigo goodness. 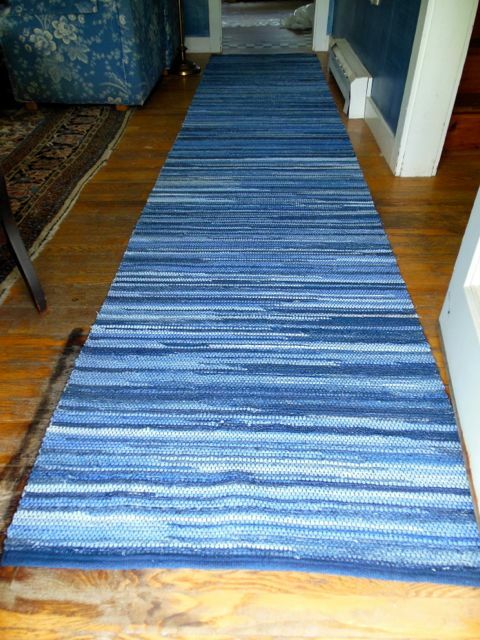 Custom denim jeans rag rug runner. (Say that 10 x fast!) Finnished dimensions 34" x 13.5' Perfect with the R.L. "Denim" painted walls. My sister-weaver-friend's husband made me this lovely Maple weaving bench to go with my old Maple Villa Countermarche loom. It's just wonderful. Thank you G for the beautiful work! 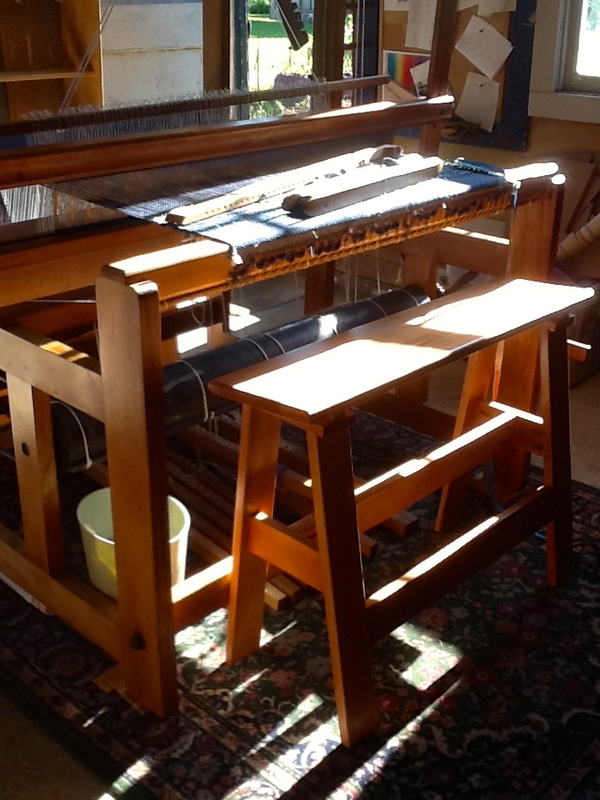 Started weaving the blue jeans 14' rag runner today. 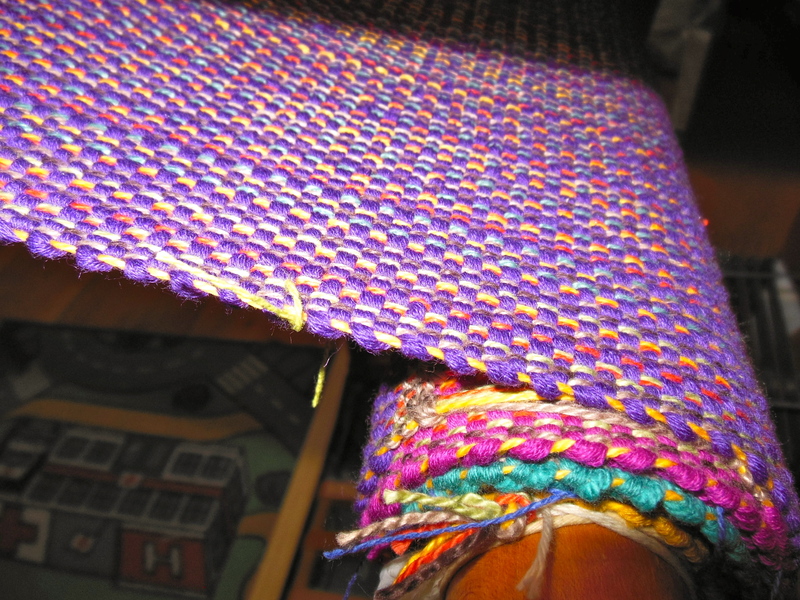 Using a thicker weft material for hems than I did in the sample means I should have less draw-in at the ends. It's gonna be a long haul - 14 feet, but the ever changing indigo blues will keep me riveted! My sister-weaver-friend's husband made me this lovely maple weaving bench to go with my old maple Villa Countermarche loom. It's fabulous. Thank you G! 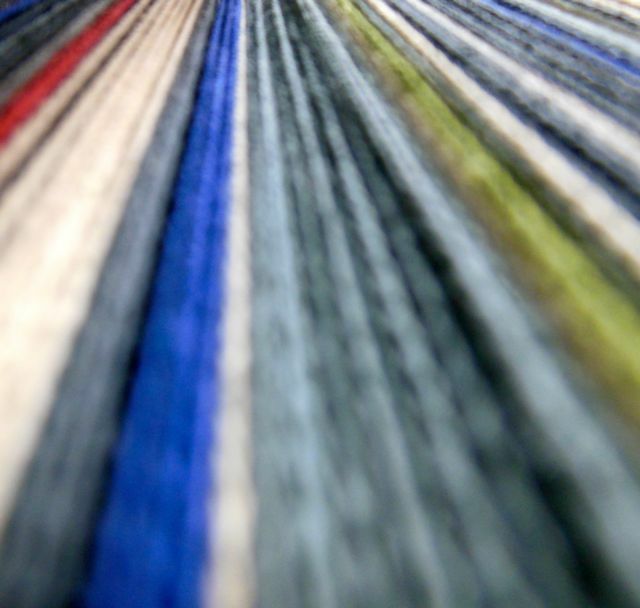 Got started weaving the jeans 14' rag runner today. Using a thicker material for hems than the sample. Looking good so far! 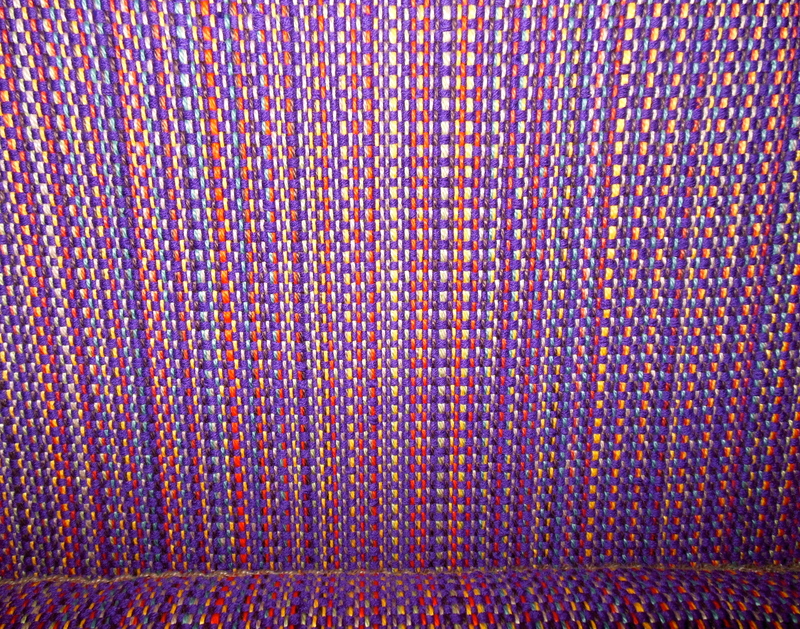 More progress on the weaving front. I completed the Twill and Basket weave towels. 14 total, 2 in each weft colour. I think they'd make a great gift for the man who loves to BBQ, or is master of his kitchen. The checks and chevrons make a really nice, classic combination and the thirsty soft cotton only gets better with age. Smart. I started a new towel warp this weekend. Reminds me of the blue/green combo of prep-school days, only in more avant guarde shades. Kinda funky weaving classic gingham checks this large and in such vivid colours. They will surely add some pizzazz to someone's kitchen decor. 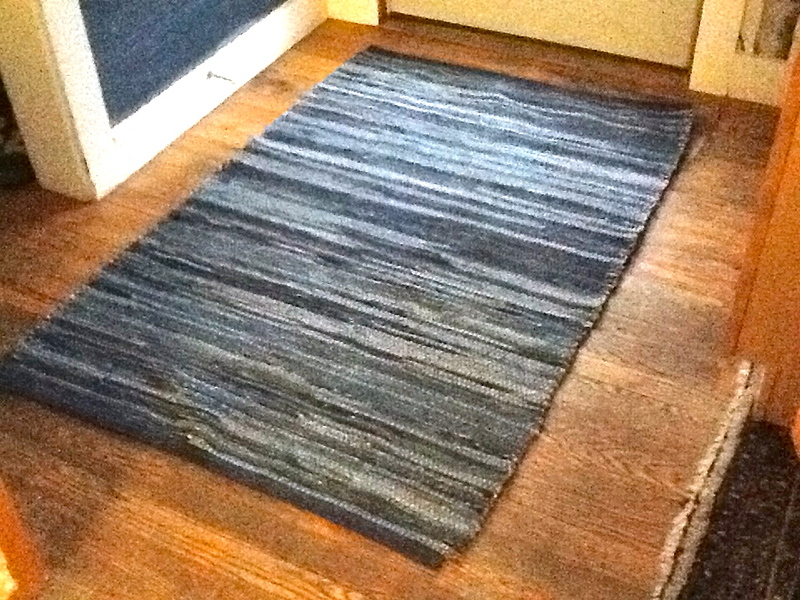 I also finished weaving the sample rag rug made of old blue jeans. 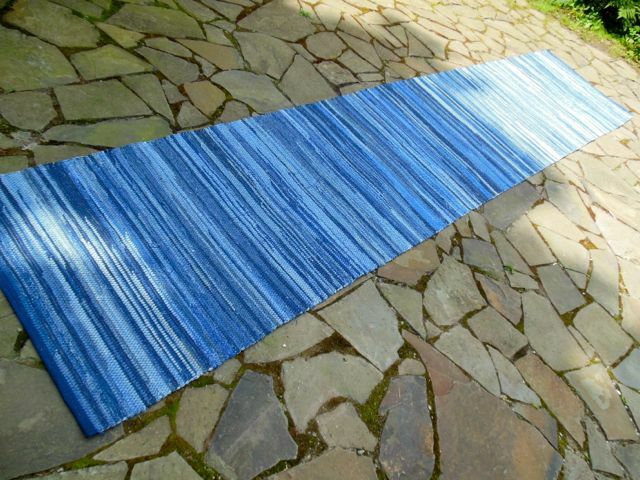 I'm ready to start the 14' long runner but need to decide on fringe or hemmed ends. 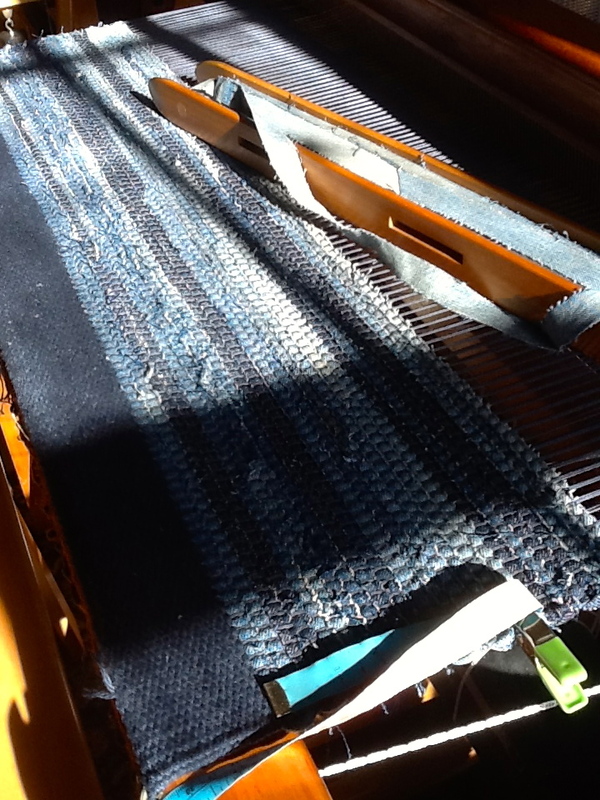 This week I finally started weaving the long planned blue jeans rag rug. 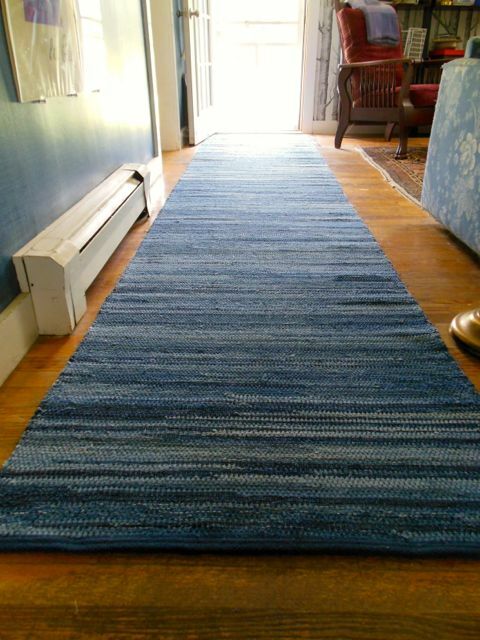 This is my first rag rug ever and I'm so impressed with the Villa loom's ability to hold high tension for rug weaving. I see many rugs in our future! I began with a small-ish rug 30" x 48" as a sample to test out the loom and my ability to use a "temple", a wooden stretcher with sharp teeth in the ends that hold the warp threads to maximum width so that all the pounding required for rug making doesn't inadvertently pull the selvage edges in and cause you to weave a triangle rather than a rectangle :) you can see it in use in the photo below. 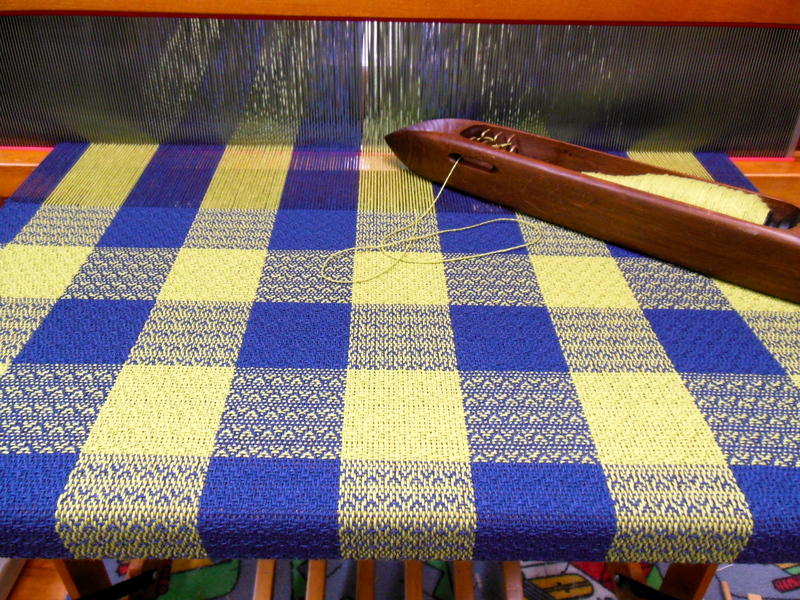 The main event on this warp is a 30" by 14' runner. I'm loving the painterly look of all the different shades of indigo. Beautiful, super durable and washable too. Sweet!